CD storage cases or CD jewel cases are the recommended way of storing your CDs, DVDs, or Blu-ray discs, in order to prevent deterioration. If you choose CDs and other optical discs of the same size as the format to which your digital information or digital scrapbooking project is saved onto, then it is important to ensure that the media are properly stored after being recorded. The ISO standard for the storage of CDs and DVDs ISO 18925:2013 - Imaging materials - Optical Disc Media - Storage practices) recommends the jewel case as the storage container of choice over other options such as paper sleeves, plastic sleeves, and the various other types of albums and containers that are available. However, there are various different types of jewel cases to choose from. The most appropriate one is the standard jewel case which is 1 cm thick and contains a holding tray. The holding tray allows the disc to be supported at the hub and locks the CD, DVD, or Blu-ray disc in place so that it does not move around in the case. Movement of the disc inside the case can lead to breakage or scratching of the disc. The tray configuration also prevents the disc surfaces from coming in contact with the CD storage case or jewel case surfaces. Contact between the case and the disc will lead to physical damage such as scratching. 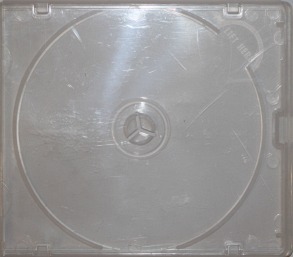 Most CD jewel cases are made of polystyrene. Unfortunately, polystyrene is brittle and can shatter and damage the disc inside. For applications when the case is not being handled often and just being stored away in a cabinet or on a shelf, the normal polystyrene jewel case is fine. In scenarios where the case is handled often, the recommendation is to use a one piece polypropylene case like the one that is shown below. This type of case has all the same features of a standard jewel case except the material is more durable and better suited to the rigors caused by repeated handling. It is also chemically inert and therefore there is no fear of any chemical interactions occurring with the disc stored inside. 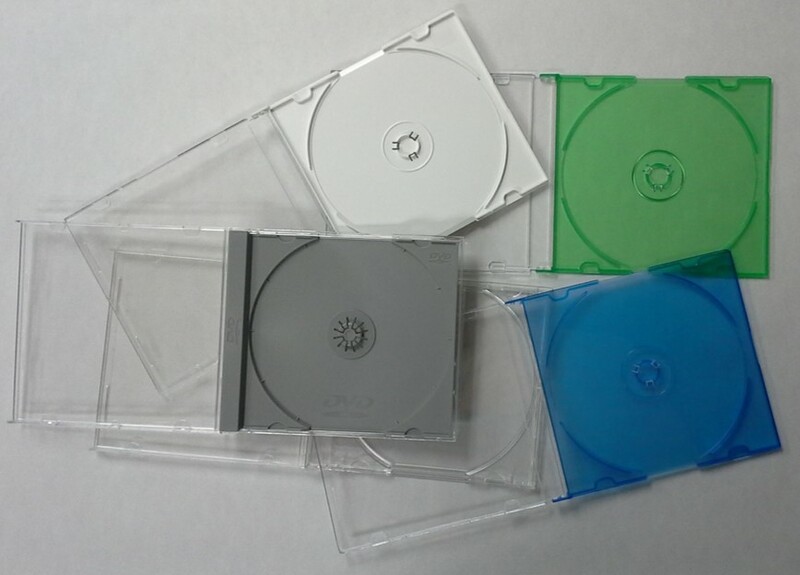 The trays that come with standard CD storage cases are often different colors such as white, black, clear, and sometimes other colors as shown in the image below. The most common trays nowadays are black and clear. White was used often at first but to a much lesser extent now. Only a limited amount of scientific research has been performed on which is best or safest for the CDs, DVDs, or Blu-ray discs. This study concluded that some of the less stable discs may be negatively affected by the jewel case, in particular the holding tray. If there is concern about the reactivity of the tray then the one piece polypropylene case is the most chemically inert and should be used for the long term storage of optical disc media. CD jewel cases are also available in thinner versions. The most common thickness for the slim jewel case is 0.5 cm or half the thickness of the standard storage case. 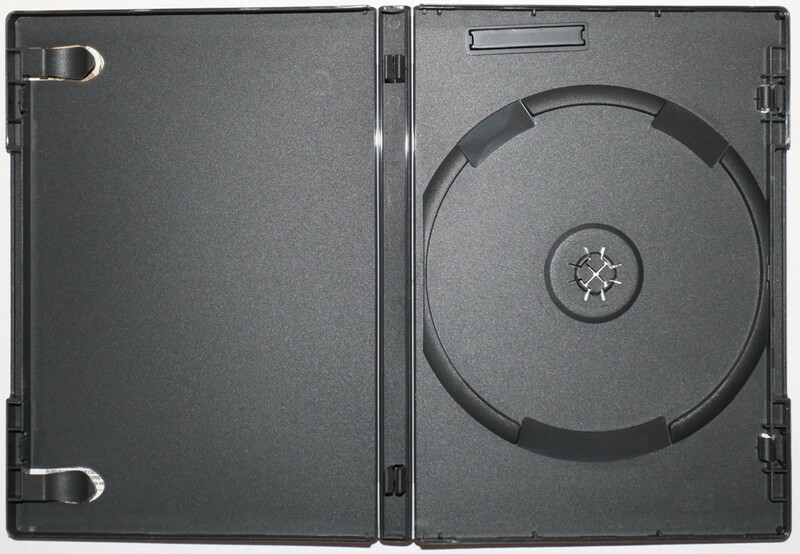 This case also contains a hub that locks the disc in place and many people prefer these slim cases because they take up half the shelf space of a standard case. However, for the slim jewel cases, the disc surfaces are much too close to the case and contact between the two often occur leading to disc damage. This is the principal reason why the slim cases are not recommended when the CDs, DVDs, or Blu-ray discs are being handled frequently. If the thin or slim jewel cases are not being handled often and are simply being stored on a shelf most of the time, although not ideal, these cases can be used for the storage of optical disc media. When it comes to DVD and Blu-ray movie discs, these often come in a different kind of storage case known as the Amaray case. An example on a typical Amaray case is shown below. This case is the same thickness as a regular size CD storage case and the same width but is a big longer. It contains a holding tray and this tray is part of the case, it is not a separate piece. Some of these cases are quite rugged and provide excellent physical protection for the disc. They are not as brittle as the standard polystyrene jewel cases. In terms of chemically reactivity, the effects these cases can have on optical discs have not been studied. However, they are likely made out of polypropylene, which is fairly inert and therefore, no significant problems are anticipated. According to the ISO 18925 standard, any printed material (especially poor quality papers) should not be stored in the CD storage case with the disc. However, some research performed on this topic has indicated that leaving printed material in the case is generally okay for read-only audio CDs or read-only DVD movie discs and read-only Blu-rays, but not okay for some recordable CD media. Any labeling should be on the outside of the case only. The CD jewel cases should be stored vertically on a shelf or vertically in a cabinet as illustrated in the picture below. Stacking of cases is not recommended because this puts a lot of pressure on the bottom cases. Also, horizontal stacks are vulnerable to falling over, which can lead to disc damage.